Happy Thursday! 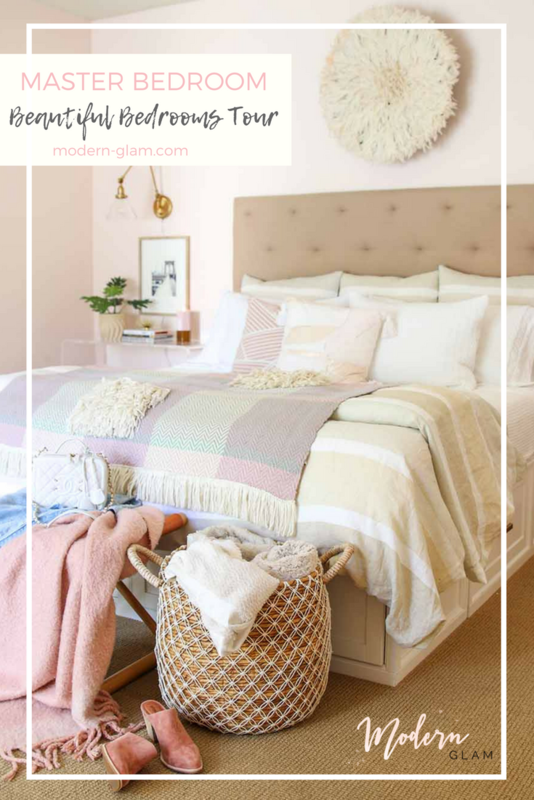 Welcome to this Beautiful Bedrooms Tour – My Master Bedroom Refresh. 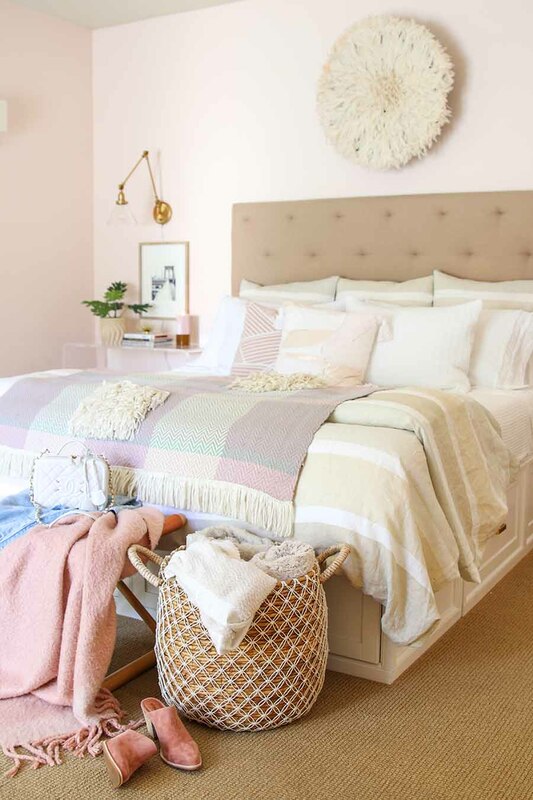 My friend Tammy of Pink Peppermint Designs has rounded up a talented group of bloggers and we will each be showcasing our favorite bedrooms! What a fun idea! So come in on and let me show you around! I have been wanting up update our master bedroom for awhile now. It really is one of the last rooms to be decorated. 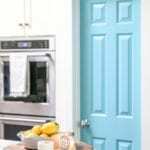 We had the walls painted Benjamin Moore’s Gentle Butterfly a few years ago and I absolutely love the color! My husband doesn’t mind the pink either. It gives the most romantic glow in the evening when the golden hour light is shining through. And with the lamps on at night it is almost ethereal! So, I knew I just couldn’t part with the pink walls. Why does it always seem like the master bedroom gets last to be decorated? Our bedroom was fine before but it lacked any character or accessories. Our duvet cover was over ten years old! And with the pink walls, there was just too much pink going on, even for me! So, I started with the bedding. New bedding was definitely in order. I ordered this Serena and Lily Coastal Stripe duvet cover and knew it was the perfect fit! 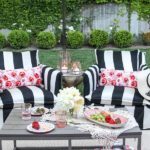 The linen feels luxurious and I love the mix of colors in the stripe. The addition of a simple waffle weave cotton blanket adds a definite hotel feel to the bedding and is perfect for the warmer weather! And crisp white cotton sheets add to that hotel night stay feel. I love the frayed edge detail on these Santa Monica sheets. The next thing I did was replace our nightstands. We did not have matching nightstands and the one on my side was a repurposed vintage side table. I moved my beloved acrylic console tables in from the living room and I am loving them as our nightstands! They make such a statement flanking the bed. I also added my favorite Mongolian Fur Stools into the bedroom. They are great for pulling out to put your shoes on in the morning or as an extra seat. To free up the clutter on our nightstands I chose to add wall mounted lights. 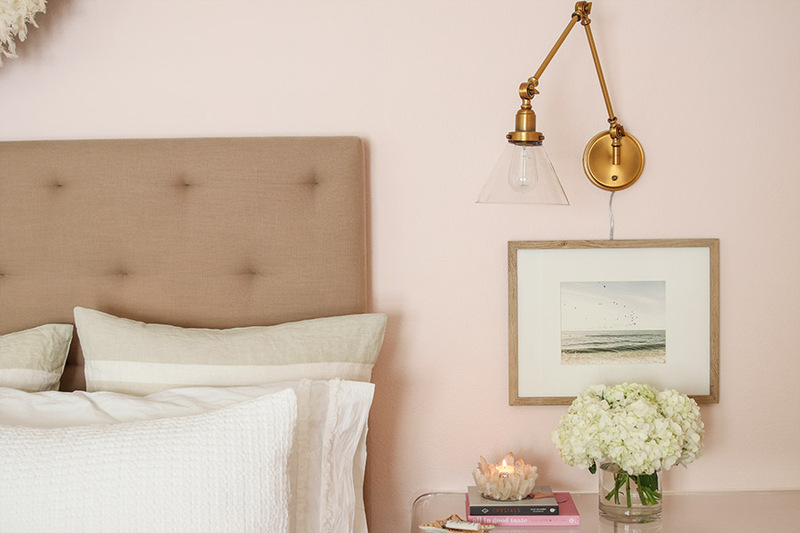 I love these brass Swing Arm Lamps and the fact that they just plug in to the wall – no hardwiring necessary! I hid the cord with our new artwork from Minted. For each side of the bed I chose artwork that reflected our personalities. For my husband, I chose this image of the Brooklyn Bridge because he loves New York City. And for my side I chose a serene picture of the beach. These frames were so easy to pop the print into as well! 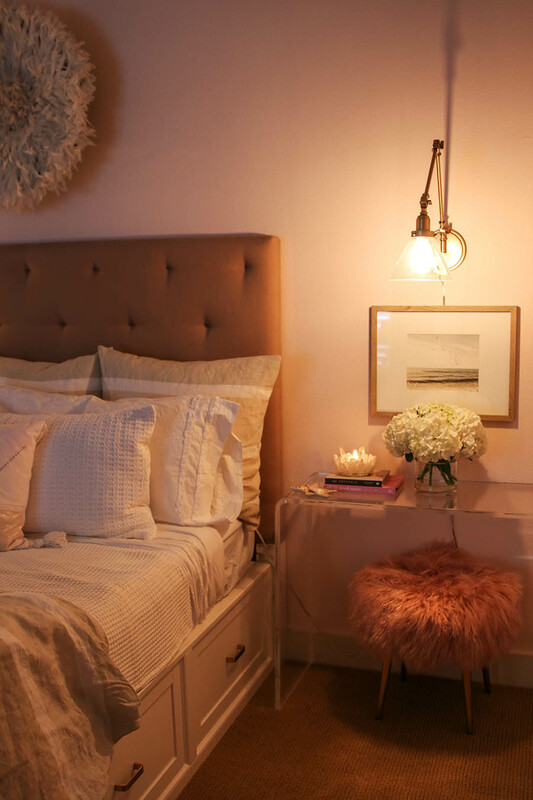 One of my favorite parts of this bedroom refresh is how welcoming our bedroom is at night. After a long day of working and being parents to our two young children, we look forward to relaxing in this room. 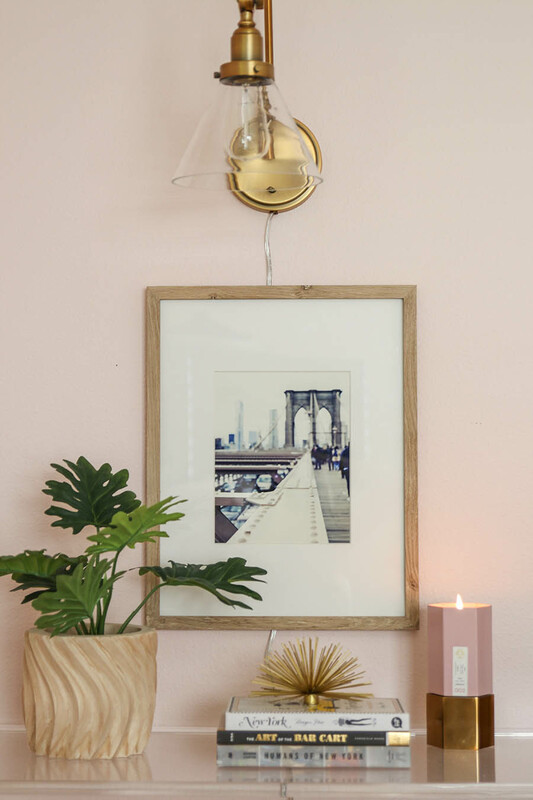 The glow of the lights against the soft pink walls is truly calming. 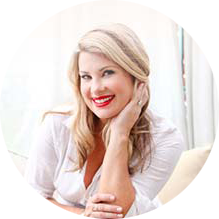 I hope you enjoyed visiting this Beautiful Bedrooms Tour – My Master Bedroom Refresh. Be sure to check out all the amazingly talented bloggers that are linked up this week! Beautifu, I love the new bedding. Bringing in a little color was such a great choice and those nightstands, how fabulous are they. Perfect for your bedroom. Beautiful refresh. Ashley this is such a gorgeous space! You have nailed the modern glam look for sure. Love you sweet fur baby too! So nice to meet you on the beautiful Bedrooms Tour. Have a great weekend! Oh thank you so much Amber! I can’t wait to sit down tonight and scroll through all the fabulous posts! 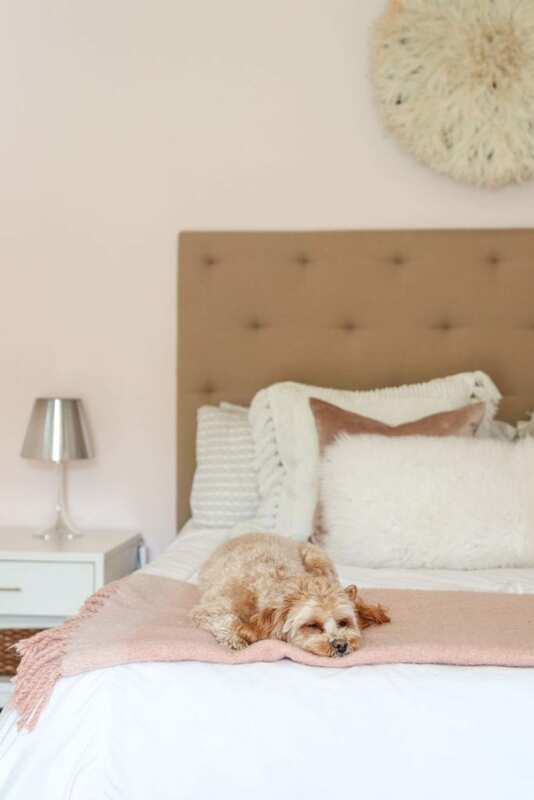 your master bedroom refresh was gorgeous! Loved every detail! oh I just LOOOOOOVE the pink! Especially at night!! It’s stunning!!! It’s so gorgeous! What dreams are made of. Thanks so much for sharing it at The Creative circle! I’m going to have to check out all the other bedrooms. 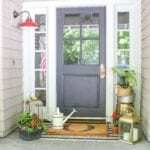 What a fun blog hop idea! Beautiful! 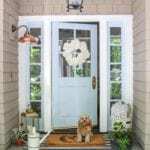 Love the blush color! I accent in my blue/white room with the blush! PInned! this is such a gorgeous space! i love how you introduced some accent and it has completed re-energised the space! 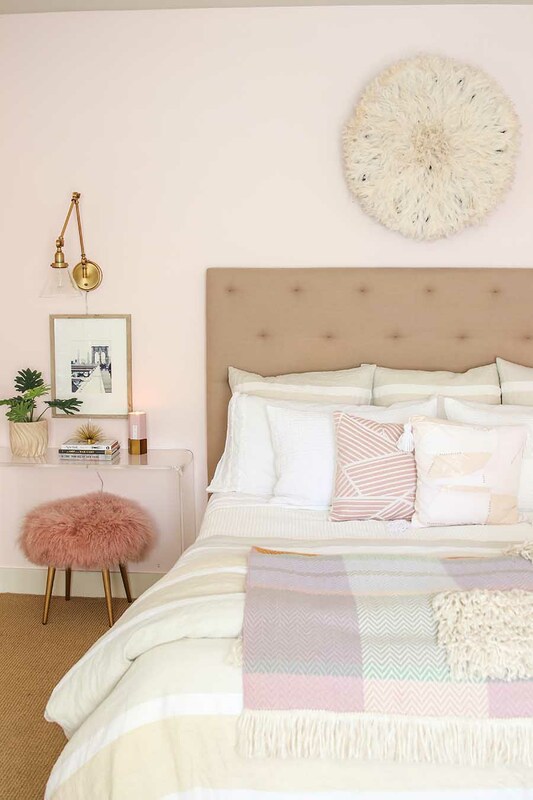 the gold/brass against the blush pink tones give the room such a beautiful soft glam feel!